On How To Get Away With Murder, everyone’s just barely getting away with murder. Integral to this show is the idea that getting away with murder is indeed quite difficult. Cover ups take time and teamwork and bring out an even uglier side to people than the murder itself. The cover ups are never ending, which is how this show is able to generate a ton of plot from things that happened a long time ago. The whole purpose of Gabriel’s character is to bring Sam’s murder back to the surface, force the original Keating Five (minus Wes) to face their Original Sin once again. Wes is gone, and for a while he was the perfect cover up for all of them, but Gabriel’s here and rightfully asking questions, and no one is really sure where it’s going to go. "Don't Go Dark On Me"
While the show certainly took its damn time getting there, the fallout of learning who Gabriel is has been much more thrilling than the build up. As Sam’s son, he not only poses a threat to the students by resurfacing the initial murder that sent them all down a dark and seemingly endless path of crime, lies, manipulation, and moral depravity, but he also represents a huge emotional struggle for Annalise. She, too, has to re-face Sam, and it drums up complicated feelings for her, made even more complicated by the arrival of Eve. “Don’t Go Dark On Me” picks up shortly after where last week left, Eve showing up on Annalise’s doorstep and revealing that she knew about Gabriel and about Sam reaching out to the wife he left for Annalise. Eve’s whole thing is that she loves Annalise and hates Sam, so it tracks that she went so far as to hack Sam’s email in the name of protecting her beloved. Even Frank admits to thinking the two of them were endgame. That said, the dynamic between Eve and Annalise has shifted slightly. Eve is happy with her new partner, who we learn is pregnant. She seems finally over Annalise, but tension remains. Their history and attraction to one another is just under the surface of all of their interactions in “Don’t Go Dark On Me.” How To Get Away With Murder can sometimes be frustratingly inconsistent with character dynamics, but this is one that has remained well written and visceral. Eve picks up on the fact that Annalise is drinking again the second she sees her. 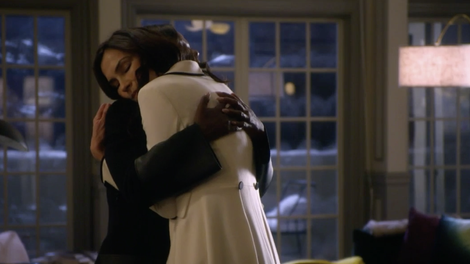 Annalise subtly tries to hurt Eve by making little comments about her new life, and Eve calls her out on it. They push and they pull, and they act like they have better boundaries now, but they don’t really. They still kiss as they say goodbye, still leave the door open. Annalise pushes back when Eve tries to encourage her to date women, tells her it isn’t as easy for her to explore her queerness as a Black woman from the Bible Belt. We’ve seen Annalise struggle with internalized homophobia before, and this moment is a nice example of this show digging into a nuanced idea about identity amid all the chaotic plotting. These moments keep the show from feeling like merely a wild murder fest. Annalise and Eve anchor this episode with some really human, emotion-laden beats. The rest of the episode, meanwhile, is pretty dominated by chaotic plotting. With Miller’s murder coming to light now, it’s time for a frame job. And who better to hatch a plan than the Frame Job Dream Team of Bonnie, Frank, and Nate? If anyone knows how to cover up a murder, it’s them. They snap into action right away, almost robotic in their approach to shifting blame away from Nate and Bonnie. Unfortunately, they have to involve Asher, who is not so great at keeping his mouth shut. He spills the truth to Michaela, Laurel, Oliver, and Connor after pressed for maybe 10 seconds. So everyone has yet another secret to keep and yet another obstacle to being able to just live their lives. The big reveal at the end of the episode, where Bonnie learns that Miller was innocent, is a highlight, but not because it’s particularly shocking. Was there ever even any real doubt about Miller’s innocence? Part of what makes his murder scene one of the most gruesome the show has ever done is the fact that his pleas of innocence and confusion seem so real. The fact that Nate is pushed to the point of reacting so violently is, admittedly, tough to swallow, especially since this show tends to just change Nate as a character at the whims of the plot. But the impending spiral of both Bonnie and Nate as they come to terms with the fact that they killed an innocent man poses some great story potential. The reveal in “Don’t Go Dark On Me” works so well because it unfolds so starkly in Bonnie’s headspace. She desperately wants to believe Miller was bad. Then she doesn’t have to deal with the guilt or the heartbreak of his death. She wants to believe he manipulated her, that Annalise was right about him using her. And it’s easy to get swept up in her desperation, even when it’s obvious as a viewer that Miller was the wrong guy. In a way, this reveal works much better than some of the show’s twistier turns. It feels, at least within the context of this frequently bonkers series, grounded. Eve eating vegan chips while talking about all the single, sober ladies in San Francisco is Lesbian Realism. Tegan and Michaela still have a weirdly flirty thing going on. Becoming DA on this show is a death wish. “I have to save me,” Annalise tells Eve. She’s not wrong. Eve is always trying to save her, but she needs to save herself, especially in regards to the drinking. Tegan has a crush on Annalise! She’s thrilled to learn that Annalise is bisexual and can barely hide her excitement, which is very cute. I hope this goes somewhere.